Earlier this month, I entered a local talent show as part of being a tiger mom in the trenches. I wanted to show my kids that not only am I pushing them to practice and perform on two instruments, I am getting down and dirty myself with my own practice and performance. In February, I auditioned on the piano (a nerve-wracking experience in itself), and then choose to play “In the Hall of the Mountain King” from the “Peer Gynt Suite” by Edvard Grieg. The piece was under the four minute time limit, something that I needed to finish learning and polish, and definitely a virtuosic showstopper. Over the next couple months, I practiced the piece almost every day (along with violin practicing, working full-time, parenting, etc. ), drilled through the technical parts, and memorized it. There were many swearing sessions with sore muscles and fingers. I have not performed solo piano in public since I was sixteen, so this is not something that I can whip off at a moment’s notice. I also haven’t memorized a piano piece in ages, as my adult brain has a hard time doing so. And let’s not mention the debilitating stage fright always that plagued me when I was younger. Angela… is software engineer and a mother of two (son & daughter). 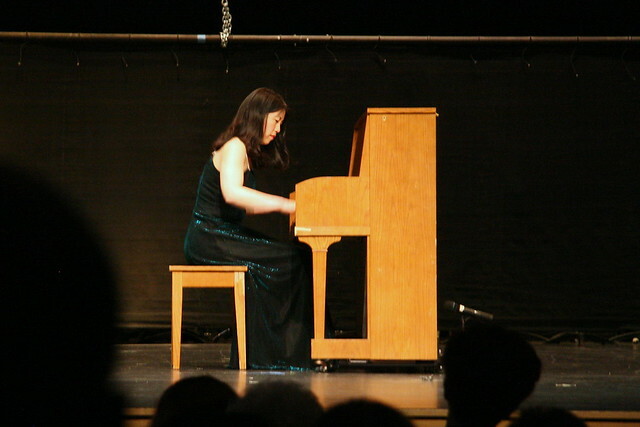 She has been playing the piano since the age of seven. Since last summer, she has also taken up playing the violin and fiddle. Her favorite composers are Chopin and Schubert. She will be performing “In the Hall of the Mountain King” by Edvard Grieg. The success part: I nailed my piece. Doug said I was poised, confident and played perfectly with conviction and passion. He said it was the best he ever heard me play the piece and I was the best performer of the night. He also said I was the best dressed :). (Yes, Doug is biased, but he never sugar coats.) The kids beamed at me with pride when I sat back down with them in the audience. Sure, there is a resemblance to Beethoven’s 5th, especially to the layman, but the huge swings in tempo and playing out of sync just made me cringe. I remember playing duets as a teenager and being much tighter than that. Even my kids thought they were terrible (they definitely don't have a problem saying when things are bad). When they announced the winners on stage at the end, I smiled and clapped graciously as the announcer passed me by. The woman standing next me, who later won for adult vocalist, said to me, “OMG, you were robbed, you were really, really good. I’m so sorry!” I just smiled, said, “That’s OK” in my best Stepford wife voice and wondered, WTF just happened? Once off the stage, I refused to take the flowers that Dova presented to me and pretty much stormed out of the place. I fumed the whole way home and could not believe that it was just a game of politics. All that hard work for nothing. Later, I started to doubt my performance and Doug reassured me that they weren't even close to the same league. What was the problem then, was I too good? Was the performance too perfect and inhuman? Did it not appear that I WORKED REALLY HARD to get to that level? The kids saw all this and had to tell me not to be a sore loser. It was ugly. So much for setting a good example. The next week, my co-workers gave me the usual “it’s not all about winning” spiel, but this quote really stuck with me, “Winning only lasts a few days. Losing lasts for months.” It’s been two weeks since the event, and I’m happy to say that I am no longer angry about it. But I did teach my kids a few good lessons. One, if you work really hard, you can reach your goals and be proud of what you accomplish (apparently not being a sore loser was not one of my goals). Two, don’t ever be a sore loser like mom. I can say that with conviction now and they will remember why. You are good, wining or not does not matter! Cheer up! It sounds great! I don't think I could ever play it as cleanly as you did! Too bad that D above middle C was horribly out of tune. And what was up with that 4-hand piano!??? That was awful! It sounds like me sightreading! And they didn't memorize it? Really? And they didn't have enough hands to turn the page? I could go on and on. You won, hands down, in my opinion, if it matters.